This entry was posted on November 20, 2012 by Jessica Anderson. We see that many companies and community organizations are beginning to use beautiful clocks as a way to recognize their employees and volunteers. And we have responded by adding a variety of options to our websites. We offer brass, glass, crystal and rosewood clocks, in desk, mantle and wall styles. We have weather station clocks and book clocks. Clocks are not just for retirement gifts. One of the best appreciation gifts you can offer an employee is a beautiful clock. They can be so much more than a time piece. They are elegant tokens of enduring appreciation. Personally, I love the clocks that have visible gears and cogs so you can actually see them working, like skeleton clocks. I love being able to see the inner-workings of these clocks! Clocks offer a great way to display your corporate logo along with a sentiment of thanks to an important client or recognition of an employee’s dedication and service. 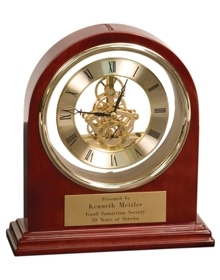 A clock award will remain on their desk, shelf or mantle and will be looked at, perhaps more than any other award. Volunteers give the gift of time to their communities because they care and they want to make a difference. Jessica’s blog last week discussed the importance of recognizing volunteers, thanking them for what they do and the time they give. We have some great local examples of how volunteers are recognized. I know because sometimes I’m lucky enough to help with the awards used in their celebrations. The SAMMI Awards celebrate and promote community involvement in the City of Sammamish. The Issaquah Community Awards is hosted by the Greater Issaquah Chamber of Commerce and recognizes community volunteers in Issaquah. Why not thank the volunteers in your world for their gift of time with a ‘gift of time’. A clock with a photo frame can be a unique wedding gift. Have the wedding date and the couple’s names engraved, then add a treasured photograph from their engagement or wedding day. Whoever you’re recognizing and whatever the occasion, consider giving a beautiful clock to make a lasting impression.